The Logitech Crayon doesn’t offer all the features of the Pencil. It includes tilt detection but not pressure sensittivity. Still, lines can be made thicker or thinner by angling the stylus. Like the Pencil, the iPad will ignore a hand resting on the screen while drawing. This input device works with the new 9.7-inch iPad that debuted this spring, as well as all iPad Pro models. 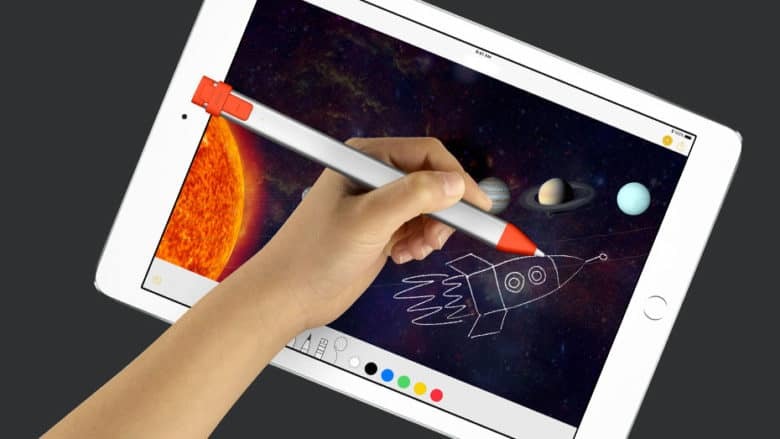 Not only can it be used for drawing, but Apple iWork apps were recently updated with new drawing features. And a stylus can be used for more than many people realize. Logitech designed the Crayon with children in mind. It can’t be disassembled without a special tool, for example. And unlike the Pencil, it’s oblong so it won’t roll off a desk. The battery can go for 8 hours before running out of juice, so a whole school day. If it gets low, 2 minutes of charging is enough for 30 minutes of use. The Crayon is charged through a Lightning port on one end. No adapter is necessary to plug in a standard iPad or iPhone power cable. Still, anyone who wants an active pen for their iPad can always get an Apple Pencil.